The Rabbi with a Blog (Rabbi Jason Miller): Is Facebook Chametz? Is Facebook kosher? If so, is it kosher for Passover? I'm not posing the question of whether it is acceptable to log on to Facebook on the first and last days of Passover, when observant Jews refrain from using computers or the Web. Rather, is Facebook activity allowed at all during the Jewish Spring festival? In the early years of the Web, the recurring joke leading up to Passover each year was that Jews should remove their browser's cookies before the holiday. 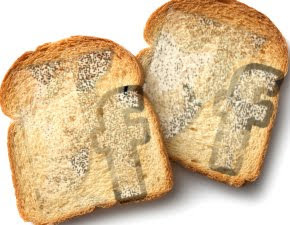 Now, two rabbis have created a Facebook group named "Facebook is Chametz" referring to the Hebrew word for leavened products which are forbidden during Passover. It is true that Jewish people get a little more observant on Passover, so maybe it's not a far stretch to assume that some of the less than virtuous aspects of Facebook may be put aside for the length of the holiday.The Facebook group created by Rabbi Shir Yaakov Feinstein-Feit, and later joined by Rabbi Ezra Weinberg, now has over 200 members. Its tagline is “I'm fasting from Facebook for Passover. You too, huh?" Shir Yaakov Feinstein-Feit (pictured) is a non-denominational rabbi, teacher, and musician. Ezra Weinberg is Marshall T. Meyer Rabbinic Fellow at B’nai Jeshurun in New York City. Referring to the more spiritual aspects of Passover, Feinstein-Feit explains on the group's Facebook page: "The Chassidic masters teach that the leavening we avoid represents our over-inflated sense of self. Get your Face out of the Book and cross into the liberation of Exodus, movement of Jah people... (at least for a little while)." This is certainly an original way to look at the culture of this social media application, which has grown exponentially in the past few years. It’s also a refreshing way to look at the Passover festival. Too often, the focus of the holiday is strictly on food concerns rather than the “chametz" that resides in our speech and interpersonal connections. Why did you create this Facebook group? SYFF: The Chassidic tradition clearly links chametz with an inflated sense of self, egotism, and narcissism. Dietary shifts alone do not necessarily touch the roots of our inflated self-interest. I'm a fan of Facebook in general, but have noticed that using the network not only can distract me from other more introspective or meditative pursuits, but it can also induce comparing mind — "so-and-so's life is more interesting, meaningful, fun, etc." I wanted to create awareness around how Facebook can actually serve to alienate us, and to find support in abstaining from something that is so common-place. EW: As someone with a strong Facebook presence among my friends, I personally found the idea of abstaining from Facebook a meaningful way to digitally disconnect from some of the powerful habit that pervades our lives. I also know a lot of Jews who don’t keep kosher for Passover or don't feel connected to that aspect of the tradition. The "Facebook is Chametz" would be a way to bring chametz out of the realm of food and into the realm of our laptops and handheld smartphones. EW: I would say I have not taken full advantage of Facebook professionally. But having over 2100 friends, it is not something I take lightly. Will you really abstain from Facebook for all 8 days? What about Twitter or other Social Media sites? EW: I will probably abstain from Facebook and Twitter all 8 days, because my Twitter account is linked to my Facebook. SYFF: I have abstained from Facebook [on Passover] entirely for the past two years, and will again. Isn't it amazing Twitter wasn't such a big thing only a year ago? I personally think Twitter is quite a different social tool and may still post Tweets, but I don't think I'll follow anyone during Passover. Should Jews (or all humans) abstain from Facebook year round and not just on Passover? EW: Refraining from chametz, in my estimation, is less about haughtiness and more about breaking routine and remembering the deeper connections we have to God, our fellow humans, and the planet. What I loved most about the movie Avatar were the spiritual elements of the Navi people. They didn’t need devices and machine technology to connect to each other and the other life forms on their planet. Sometimes you can connect more by disconnecting. That is the essence of spiritual technology. Refraining from chametz, just like refraining from work on Shabbat, connects us to something deeper by disconnecting us. So, the bottom line according to these two rabbis is that while Passover is a certainly a time for putting aside the bread and the cereal, it might be a good idea to unplug from the chametz of Facebook as well. In a similar vein, CNN had an article about not using electronic equipment for 24hours, citing the Shabbat. I was amazed at the crass, selfish, and shallow remarks and reasons given by some of the people who commented. Honoring Shabbat and Chagim also honors oneself by leaving our day to day world.